Tonsils are the bodies consist of lymphoid tissues. Lingual tonsils is the type of tonsils present at the base of the tongue on back side, one on both sides. The lymphoid tissue is responsible for assisting the immune system which produces antibodies against the antigens invading in body. The lymphoid nodules present may have 30 to 100 follicles. These lingual tonsils appear as the exophytic mucosal small masses along with folds and crypts. These are present exactly between the circumvallate papillae and the lining of vallecula and it extends up to the root of the epiglottis. The lingual tonsils may be painful and swollen as a result of inflammation occurred duet to any infection or allergy. The tonsils may also be painful after tonsillectomy or adenoidectomy. These are the main reasons behind the painful lingual tonsils. Pain always occur due to swelling of lingual tonsils. Inflammation occurs due to the invasion of any foreign particulate. Whenever an antigen enters in the body, the antibodies of the lymphatic nodes start acting against those antigens which cause inflammation and pain in the lingual tonsils. Any rash or allergy also occur as a result of viral or bacterial attack. The lingual tonsils get enlarged due to many reasons behind it. The enlargement may be due to inflammation of the lingual tonsils. 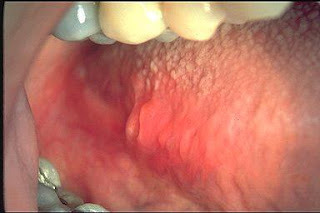 The lingual tonsils normally present in a reticulate pattern on the surface but the enlargement of the lingual tonsils may disturb this pattern. The enlargement of lingual tonsils is known as hypertrophy. The lingual tonsils when get enlarged may cause some problems like obstruction in the airway and carcinoma of squamous cells. This carcinoma is the most common type reported and it appears as the ulcer on the back side of throat. Lingual tonsils are painful and swollen as a result of inflammation. Along with inflammation there may be many other reasons behind swelling like allergy and infection. It may be secondary to the surgeries like tonsillectomy and adenoidectomy. Normally there are nodules seen on the surface of lingual tonsils. These nodules are of 5 to 7 mm and smooth on touch. But in the swollen lingual tonsils, these nodules appears to distend posteriorly. And in some severe cases of swollen lingual tonsils the nodules may extend and reach up to the vallecula. Which in turn may cause airway obstruction. The lingual tonsils can be removed via lingual tonsillectomy. In this technique, the tongue is pulled out and the lingual tonsils get clamped. The tonsillectomy is indicated in patients with enlarged lingual tonsils which causes problem in airway, disturbed sleep apnea, recurrent and chronic infections and in case of cancer or malignancy. There is another way of removal of lingual tonsils is used and preferred which is removal through laser or cautery. These two methods cause less bleeding. Care should be taken after tonsillectomy and the patient should avoid aspirin, as the use of aspirin may cause postoperative hemorrhage.